The Now Now Due Out June 29 via Warner Bros.
Damon Albarn's Gorillaz are releasing a new album, The Now Now, on June 29 via Warner Bros. Now they have shared another song from the album, "Fire Flies." Listen below via a "visualiser" video for the song, followed by Gorillaz's upcoming tour dates. The cartoon band previously shared three tracks from The Now Now, album opener "Humility" (which features the great jazz guitarist George Benson and was our #1 Song of the Week), "Lake Zurich," which is a near instrumental track, and "Sorcererz." Gorillaz released their last album, Humanz, just over a year ago, but now they are already returning with another new album. Gorillaz, along with James Ford and Remi Kabaka, produced The Now Now, which was recorded entirely at Studio 13, London in February this year. "Humility" was shared via a video directed by the band's creative director, co-founder, and illustrator Jamie Hewlett. It was shot in Venice Beach, California, and features the animated band interacting with comedian Jack Black. 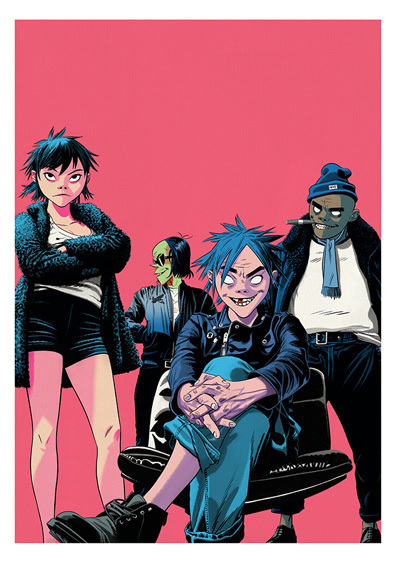 A previous press release described the album as such: "In contrast to the cast of characters that joined the apocalyptic party thrown by Damon Albarn and his cartoon crew on last year's multiple-Grammy-nominated Humanz, The Now Now sees the band largely eschewing guest stars, taking it back to the core Gorillaz crew: blue-haired, sweet-natured dreamer 2D on vocals; whip-smart Japanese badass Noodle on guitar; Brooklyn-born philosopher and the meat-behind-the-beat Russel Hobbs on drums. And with Murdoc Niccals temporarily indisposed, bass duties on the new album have been taken up by erstwhile Gangreen Gang member Ace (explaining the "FREE MURDOC" signage that's been popping up everywhere from Coachella to the Kentucky Derby to Change.org and Reddit)." Fun fact, the Gangreen Gang are actually villains from The Powerpuff Girls! So now a Powerpuff Girls character is in Gorillaz. Maybe the girls themselves can show up in a future Gorillaz video?